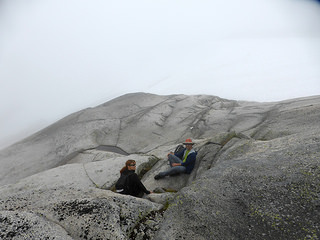 Description: The Flatiron Peak hike is 11 km (7 miles), with an elevation gain of 690 meters (2,264 feet). 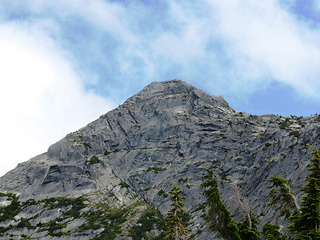 Start on the Needle Peak Trail near the Coquihalla Summit, but turn West toward Flatiron Mountain once you’ve hiked past the tree line. The peak is actually quite flat, with fantastic open views. We ate lunch overlooking a pretty little alpine lake near the top and then went and photographed each other next to what looked like an alien spaceship that had landed on the peak (apparently it’s some sort of transmission tower). Difficulty: Challenging. I would rate the first portion of the hike (the forest portion) as advanced and the later portion as intermediate. The first stretch is relentlessly steep and the terrain is rugged, with plenty of roots and slippery rocks. Expect to do some scrambling (the scrambling isn’t too difficult because there are lots of tree branches and roots to hold onto). I wouldn’t recommend this one for anyone who doesn’t have a high level of fitness. Required Equipment: Hiking boots, enough water and food for the day, sunscreen, sunglasses, hat, mosquito repellant, and a rain jacket just in case. We found patches of snow near the top in July – it was manageable in hiking boots, but if you’re going during months when the snow may be deeper and cover more ground, you may want to bring microspikes. 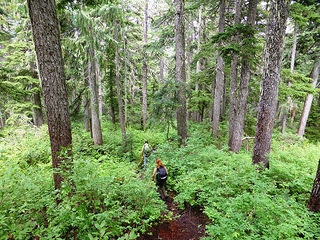 The trail is rugged but well-established, making it easy to follow. There are fantastic surround views once you get above the tree line. You’ll get a great workout making your up the steep forest stretch. There are lots of aggressive mosquitoes. The very steep downhill stretch on the way back is hard on the knees, so this isn’t a good hike for anyone who suffers from knee problems. 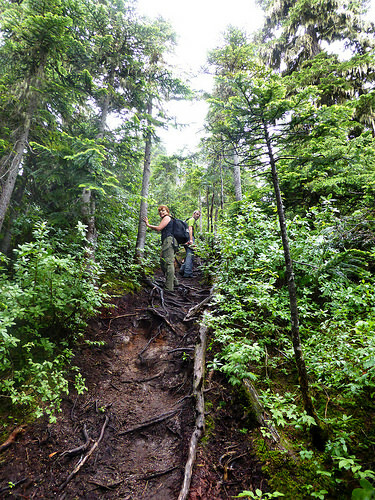 Getting through the first part of the hike requires a high fitness level, which excludes a lot of hikers who would really enjoy the later portion of the trail. 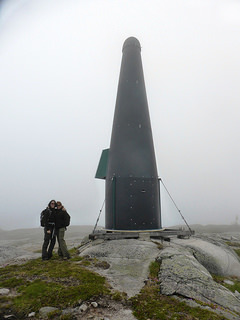 Dress in layers – we found it quite warm on the uphill stretch due to the exertion required, but chilly in the open areas with the wind blowing. For more information and driving directions, see the LiveTrails.com Flatiron Peak page, the TrailPeak.com Flatiron page, and the Bivouac.com Flatiron page. 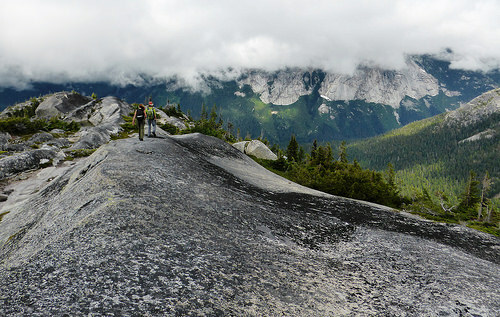 For more great hikes in BC, see the Rainbow Trail to Rainbow Lake, the Lions Hike (Binkert Trail), Mt. 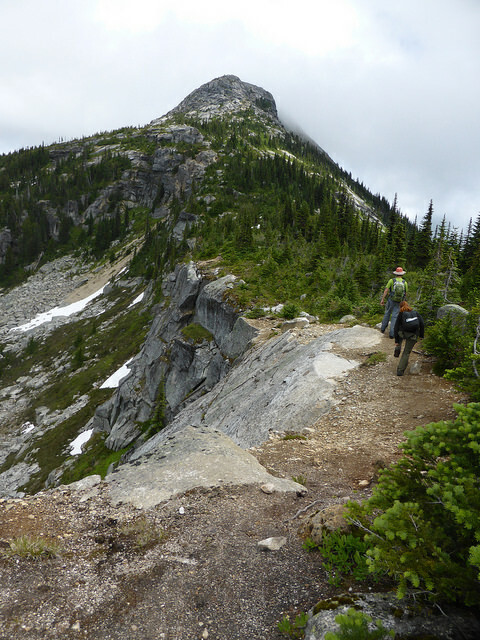 Seymour Three Peaks, the Red Heather Trail, and Al’s Habrich Ridge. 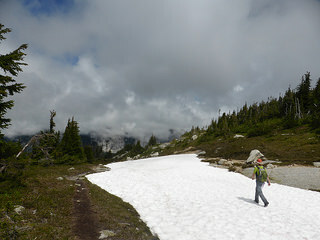 For Northwest U.S. hikes, see Harry’s Ridge and the Heather – Maple Pass Loop.